Whether your elderly loved one is new to dentures or you’re simply new to helping them with their dentures, there are some tips that can make the job a little bit easier. Your loved one’s dentures make it possible for them to continue to eat healthy foods and they also help to give them a better sense of self-confidence about their appearance. These tips can help you to care for dentures properly. Your loved one’s dentures need regular brushing in order to keep them clean and to remove both food and bacteria. Some people use a regular toothbrush for this, but most dentists recommend using a brush designed specifically for dentures. Talk to your loved one’s dentist to find out how they recommend you brush them. Keeping their dentures clean helps keep your loved one’s mouth healthier, too. Some people don’t want to wear their dentures every day, and that can be okay. The key is to store them properly whether they’re out of your loved one’s mouth overnight or for a few days. 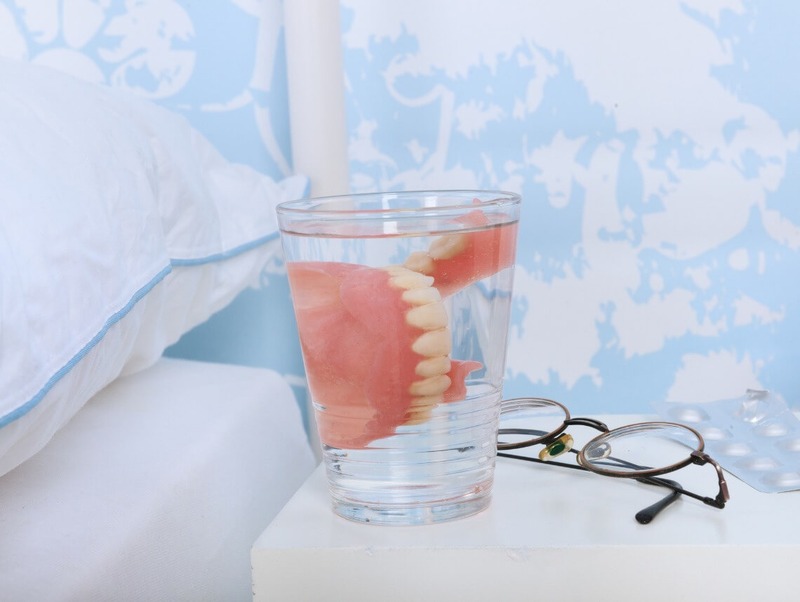 The best way to store them is in a denture bath that allows the dentures to soak either in plain water or a mixture of denture cleaning tablets and water. That way they’re always ready to go the next time your loved one is ready to put in their dentures. Sometimes your loved one may have a health condition, such as arthritis, that makes taking care of their dentures or wearing their dentures more difficult. In some cases, such as with diabetes, gum disease can actually make their dentures fit improperly. It’s important to keep track of how well your loved one’s dentures are fitting and whether there have been any changes. Enlist the help of your loved one’s senior care providers, too. They can likely let you know some clues to look for. It’s a common misconception that once your loved one is wearing dentures, they no longer need to go to the dentist. The truth is that their dentist can look for changes in their mouth and in how their dentures fit. Your loved one may have other conditions, too, such as gum disease, that require additional care. Make sure your loved one visits the dentist regularly to keep an eye on their dental health. Taking care of your loved one’s dentures will get easier the more you do it.